Does Your Lawn Look Patchy With Thin Or Bare Spots? We specialize in lawn overseeding to restore your damaged lawn. If your lawn looking is looking thin and brown with obvious bare or scalped spots then you should consider lawn overseeding to restore your lawns appearance. By putting down a layer of new grass seed over your lawn in the spring or fall, it can do wonders in helping the thin areas to thicken up. A few weeks later and your lawn will start to look thick, lush, and green once again. Irreco LLC is a landscaping and lawn care company based out of St. Louis, MO. We specialize in lawn care and lawn restoration services including lawn overseeding. It’s important to note that not all lawns are great candidates for overseeding. There are some lawns that might be so far gone or extensively damaged that replacement or “reseeding” may be necessary. Overseeding will help deal with thin patches, scalped areas, or areas that are dead and dying but it’s not a service designed to restore an entire lawn. If your lawn is in otherwise decent shape then we recommend overseeding of the thinning or brown areas at least once every year or two. What Type Of Grass Seed Works Best For Overseeding? The most common type of grass we see in lawns throughout St. Louis, is Fescue. For this reason we use a custom tall fescue blend for our overseeding applications. Fescue is actually a very versatile grass that can handle all of the weather our area sees throughout the 4 seasons. The best time to overseed your lawn is generally during the early fall or early spring when the grass is still growing vigorously. Overseeding works amazingly well in conjuction with lawn aeration as it allows the new grass seed to really take a good hold. Why Choose Irreco LLC For Lawn Overseeding? We understand that you have many lawn care companies to choose from throughout St. Louis. We just want you to know that when you choose to work with Irreco you are partnering with a small, locally owned business that has many years experience keeping St. Louis lawns looking their best. 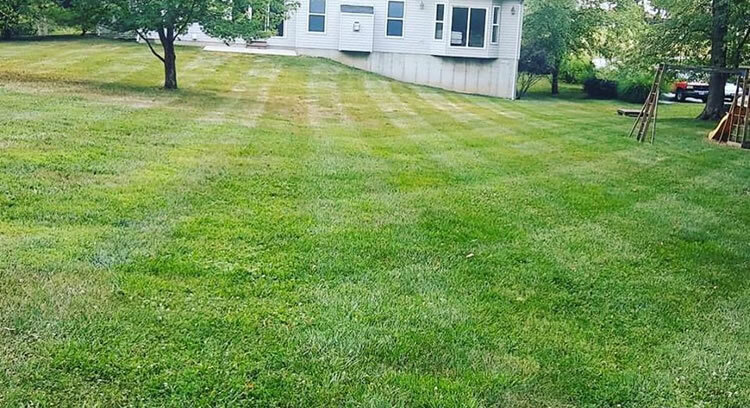 You can expect knowledgeable, reliable lawn restoration services from a company that cares about your properties appearance and our local reputation. We’re more than just a couple of guys in a pickup truck, we’re a professional team of lawn care specialists who’s only goal is to make your property stand out with a beautiful, lush, green lawn. If you’d like to get an estimate to overseed your lawn then please give us a call (314) 246-0099 or fill out our online contact form and we’ll get back to you right away (usually the same day).